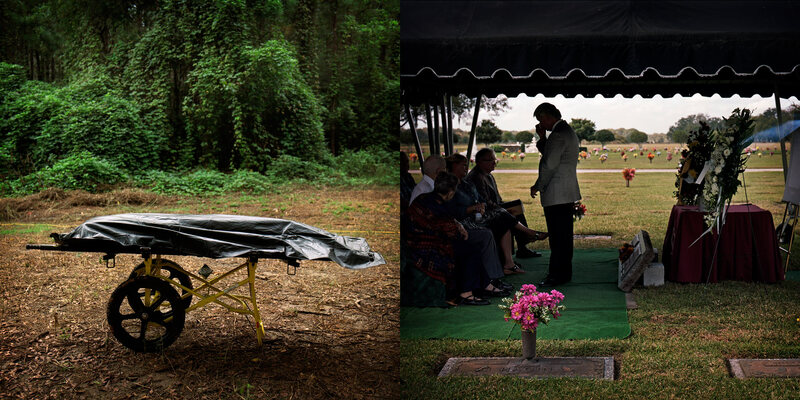 Left: The first set of human remains removed from a small cemetery at the Arthur G. Dozier School for Boys. Researchers found 55 sets of remains, despite only 31 grave markers at the site. The remains were identified as belonging to George Owen Smith, who went missing at the school in 1940. Right: Glen Varnadoe is overcome with emotion as he speaks at his uncle Thomas Varnadoe's funeral in November, 2014. Thomas died while a ward of the state of Florida at the Florida School for Boys in 1934 and was buried in an unmarked grave. Researchers from the University of South Florida located his remains and were able to return them to his family. Varnadoe estimates he spent $200,000 of his own money trying to locate Thomas' remains.